So I'm still trying to reach my goal weight (if I could just stay away from chocolate, it would be a lot easier), but in the meantime, I'm taking the victories where I can. One of my victories is that running is getting easier. Last night, it was like the skies opened up and the heavens said "Today, Kelly, you shall run, for you are scheduled to run a half marathon in 32 days, so get moving." Or something like that. Even with stopping for traffic, I maintained a pace of 9:03 for five miles, and it even felt good. Another victory came in the form of a pair of hot little boots last weekend. When the whole boots craze came out, I was pretty much excluded. Everyone gains weight in different places, and apparently, I gain weight in my calves. 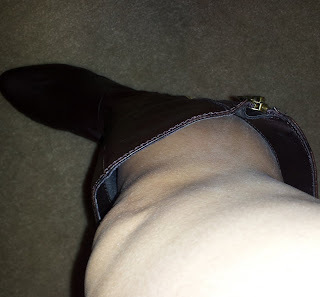 I couldn't find boots that went over my fat little calves. Last year, after losing some weight, I finally found a pair of boots that fit, but it was tight and a little uncomfortable. I still bought the boots because I was so excited I could actually zip them up. They were black with high heels and I enjoyed them. This year, the trend is flat boots. I saw these boots at JCPenney's a couple of weeks ago and made a mental note that I wanted these. When I got a gift card, I decided that if my fat little calves fit into the boots, I was buying them. I went last Saturday and found out that not only did they fit, but they were big. Big enough to tuck in my jeans or wear leggings. Big enough to make me feel like I'm finally getting small enough. I will officially be wearing these boots non stop for the next three to six months, just in case you're wondering.